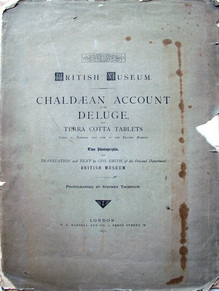 Stephen Thompson (1831-1892) and George Smith (1840-1876), Chaldaean Account of the Deluge from Terra Cotta Tablets Found at Nineveh, and Now in the British Museum (London: W.A. Mansell, 1872). Graphic Arts Collection GAX 2012- in process. Brothers Stephen and Thurston Thompson, along with Roger Fenton, were hired by the British Museum to photograph and document the Museum’s collection. During the 1850s and 1860s, they worked their way through the vaults, taking the objects outside (when the weather allowed) to get the best light. 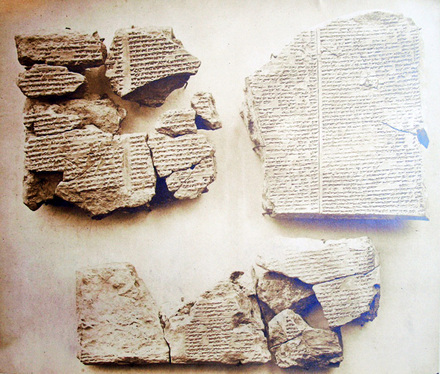 In 1872, Stephen took on the terra cotta tablets in the department of oriental antiquities. Two of his albumen silver prints were published in the Museum’s series, Album photographique, along with a translation and commentary by George Smith (1840-1876). 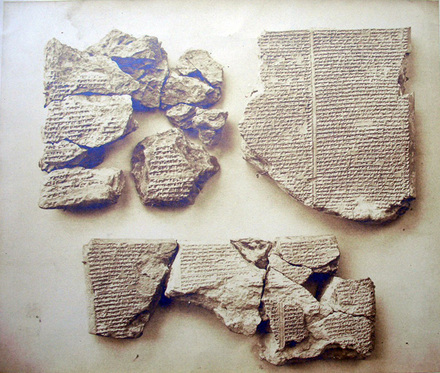 Smith had been hired to piece together the fragments of tablets from Ninevah and in 1871, published “The Phonetic Values of the Cuneiform Characters,” to assist in the transcription and translation of Assyrian documents. The following year, he found what he believed to be evidence of the biblical flood as accounted in the book of Genesis.